Isabelle Rohr is a visiting lecturer at King’s College, University of London and at St Mary’s College, University of Surrey. She has published several articles on Spanish-Jewish relations in the twentieth century. She received her PhD in International History from the London School of Economics and Political Science. Rohr’s work deals especially with politics and ideology, and is most original particularly in its analysis of the influence exerted by the new Spanish imperialism in northern Morocco. That the Spanish right was generally anti­Jewish is not, of course, a new finding, and such an orientation was partially contested by the new, early twentieth­century trend of ‘philosephardism’ on the part of some Spanish nationalists, who held that Sephardic Jews were superior to other Jews in having been ‘purified’ by Spanish culture. Rohr does an able job in sorting out these only partially contradictory trends, and contributes more than a little primary research in Spanish archives to present a more complete account. ... The most important part of the book deals with the role of Spanish Morocco, which contains the highest proportion of new data. As Rohr emphasizes, there has been a considerable amount of recent literature in Spain on Spanish policy and actions in the Protectorate, focused almost exclusively on relations with and attitudes towards the Moroccan population, while generally ignoring the place of the once significant Jewish population in northern Morocco. In the last and most thought provoking of the book’s five chronological chapters, Rohr investigates the Spanish government’s reluctance to repatriate its Jewish nationals from occupied Europe. The fact that a significant number of Jews were able to escape via Spain does not mean that the official attitude of the regime was benevolent toward Jews. Rohr explains that while the Francoist regime set itself up after the war as the savior of Sephardic Jews from Eastern Europe, such rescues were the personal initiatives of Spanish diplomats rather than responses to official directives. Likewise, Rohr points out that during the same period Franco developed pro-Nazi policies and anti-Semitic rhetoric and that the coalition of antiliberals and fascists that supported his regime used anti-Semitic propaganda repeatedly. This took place even after 1943, when Spanish foreign policy was shifting more toward neutrality because fortunes in the world war had changed. It is true that, since Franco was convinced that Jews controlled the politics and the economy of the United States and Great Britain, and since from 1943 he was increasingly persuaded that Hitler would lose the war, he was not unaware of the need to improve his relations with Jewish groups. Consequently, anti-Semitic propaganda decreased considerably, the section of political police specializing in the persecution of Jews was dissolved (incidentally, the book makes no reference to the creation of this unit in 1938 or to its functions), the treatment of Jewish refugees improved, and closer relations were sought with the Anglo-Saxon powers. And, as Rohr demonstrates, the Spanish government accepted contacts with the World Jewish Congress and subsequently styled itself a good collaborator with this organization. This improvement in relations was a first step toward creating the myth of Spain’s rescue of Jewish refugees. But the truth is that while measures aimed at the persecution of the Spanish Jews were allowed to lapse (previously, during 1939–42, some Jewish refugees had been imprisoned or, on a few occasions, turned back at the border), the regime’s fundamental policy toward Jewish refugees was unchanged. In fact, as the author documents, the Francoist regime refused to give shelter to persecuted Jews from Nazi Germany and Fascist Italy even when they had Spanish nationality: Jewish refugees were allowed to pass through Spain but were not permitted to settle there. Thus, Rohr concludes, the Spanish policy toward Jews was similar to that followed by such other countries as Brazil, Japan, and Italy. ... In short, this is a thorough study that adds to our knowledge both of anti-Semitism in Spain and of the antiliberal right that brought about the coup d’état of July 1936 and thenceforth supported Franco’s leadership. What should be highlighted above all is the author’s contribution on the Francoist regime’s treatment of Jewish refugees during the Second World War and the relationship between foreign policy and political culture (the political myths of Golden Age, conspiracy, Spain’s role in saving Jews, and unity). 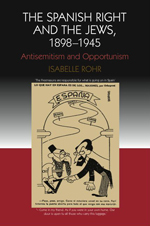 An original contribution to the historical literature in that it combines a lucid analysis of ‘indigenous’ Spanish sources of antisemitism over the long term, with a penetrating appraisal of the specific mixture of ideological and strategic (indeed frankly opportunistic) motives driving the contradictory policies adopted by Francoists towards different groups of European Jews in the period between c.1936 and 1945… The particular strength of Dr Rohr’s work is its understanding of the constant interplay between the political mythology of Spanish antisemitism and Spain’s geopolitical interests and colonial aspirations. And it is the way her longue durée analysis informs the intelligent dissection of the war years (1939–45) that makes hers such an impressive piece of work. The author has reconciled several different kinds of history – exploring political myths, colonialism and foreign policy during wartime as well as contributing to both Spanish and Jewish history… The subject of the Jews in Spain is one that abounds with clichés, largely because relatively little has really been worked out historically about the Jewish legacy in the contemporary period. This book explores the subject sufficiently broadly to allow us to view Spanish-Jewish relations in both the historical and historiographical contexts, and furthers our understanding of the triangular relationship between the Franco government, and Jews and (to a lesser extent) Muslims in Morocco, especially during and after the Spanish civil war… This engaging, stimulating and original work firmly gives the issue of race in contemporary Spain the historiographical importance that it merits. Just as the Moorish ‘Other’ has long been recognised as a significant term of reference of Spanish identity, this books shows how the construction of ‘the Jew’ plays a similar role. This book debunks the so-called ‘paradoxical’ nature of Franco’s supposed benevolence towards the Jews, showing that any generosity on the regime’s part was both opportunistic and unreliable. Dr Rohr grounds Franco’s relationship to the Jews during World War II in the fascinating and complex history of post-Inquisitorial Spanish attitudes towards Jews, ranging from Philosephardism to various forms of antisemitism according to shifting ideological goals. Rohr’s reading of Franco’s neo-Philosephardism in the context of his colonial ambitions in Northern Africa is groundbreaking. This careful history traces the determinants of Spanish right-wing policy towards the Jews, traditional Christian anti-Judaism, the role of the Reconquista in the national mythos, and the conspiratorial fantasies of The Protocols of the Elders of Zion. Indeed the last morphed into Judeo-Bolshevik and Judeo-French conspiracy theories, the former especially during the Civil War, when the nationalists fought the Soviet-supported republic and the latter because of French-Spanish imperial rivalry in North Africa. These Spanish imperial designs were partly the inspiration for what Ms. Rohr calls philosephardism. Practically, it meant, for the Spanish right, an attempt to make use of Spanish Jews in North Africa to further Spanish imperial ambitions. The author maintains that the Franco regime’s attitude to the rescue of Jews was opportunistic rather than philanthropic, and changed as the tides of the Second World War turned in favour of the allies. One consistent concern of the regime was to avoid the reestablishment of a permanent Jewish community in Spain. The Spanish Right and the Jews is a central contribution to the historiography of anti-Semitism in Spain. Its combined analysis of ideology and foreign policy sets the volume apart from some other significant works on the subject, such as Gonzalo A’ lvarez Chillida’s El antisemitismo en España (Madrid: Marcial Pons, 2002). More importantly, the book exposes the Francoist myth of the dictatorship’s benevolence towards the Jews. Franco’s policy on the Jewish question was always selfish and hypocritical, but his fabrications were allowed to stand unchallenged after World War II. Harry Truman and, particularly, Winston Churchill wanted Franco on their side and the fairy tale of a compassionate Spain became a useful manner to cleanse Franco’s pro-Nazi actions. The myth was to last longer than the dictatorship itself.